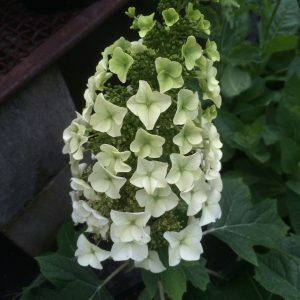 Fantastic smaller scale Oak Leaf Hydrangea that is also a very heavy bloomer with large cone shaped flowers that are up to a 1′ long and protrude in every direction. Densely branching plant to only 3′ x 3′ in 6 years. Flowers have a light fragrance. Large leaves take on pink to red tints in late autumn. Flowers too that remain age to rich pink. Full sun to part shade in rich, moisture retentive soil. Regular summer water. 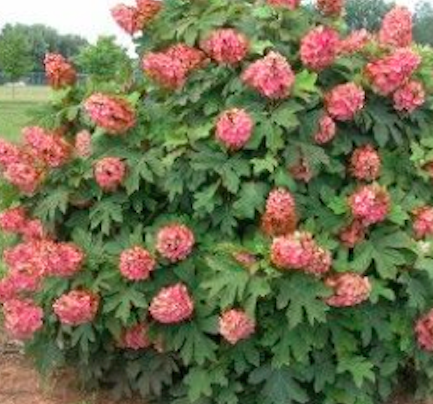 This extraordinary release from the National Arboretum allows this wonderful multidimensional shrub for smaller gardens. Somewhat brittle when young. Site accordingly.